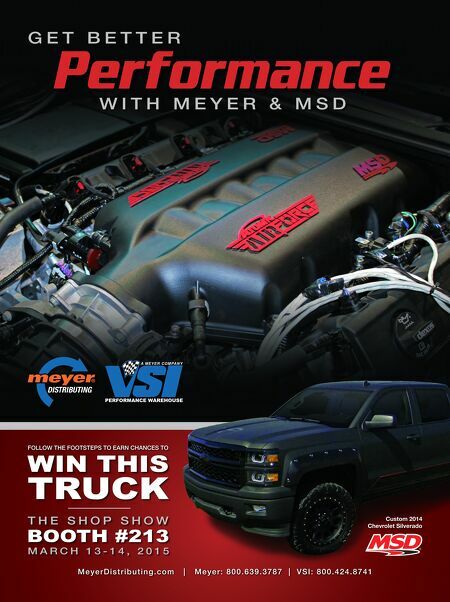 128 n Performance & Hotrod Business n March 2015 ONE MORE THING... A ccording to author tim odom in Winning Your Share: How Retailers Can Compete at the Intersection of Digital and Brick and Mortar, more than 90 percent of shoppers for performance parts and truck accessories search online first, even when they intend to buy locally. Think about that for a moment. This means you must have an online presence to even have a chance at selling consumers the products they want. Keywords, Odom says, are basic com- ponents that you can use to leverage Internet searches and make them work better for you. In the digital age, you can't get by without understanding what these are, and how they apply to your business. The Right Words With search engines and social media sites determining who sees your website, keywords are the terms you use to describe your business. Without them, these search engines would have no idea how to direct potential buyers to the sites they want to see. Brands you sell may be important key- words if they have a lot of search volume, such as Edelbrock, Hedman or Borla, for example. You still want to attract users who are searching for the generic terms as well, like intake manifold, exhaust headers or exhaust systems, especially since they're probably higher up the sales funnel than someone searching with the brand's name, but you also don't want to diminish the effectiveness of those branded names. Odom suggests you may want to use a string of keywords like Borla exhaust Kansas City if you feel there's a strong interest in buying locally. This is a long-tail keyword, for those who are looking for more specific answers to their questions, and exactly the traffic you want to attract to your website. Why? Because they are focused on find- ing that exact product, one that you want to sell them. It eliminates them asking for brands you don't carry, and directs them to what you do. Lauren Polinsky, senior account manager for SEO (Search Engine Optimization) at marketing consultant company Merkle | IMPAQT, writes that most keywords aren't as straightforward as we like to think—they have several varia- tions and synonyms, not to mention long- tail derivatives. You're simply not going to be able to hit all of them, so conventional wisdom says choose those that have the most traf- fic and make sure you've got the targeted keywords your customers will use most often to find you. All the Answers Think of it this way: they're looking for the answer to something specific. Maybe they're wondering which headers fit a 5.7- liter LS3 engine and they type in, "What exhaust headers fit a 5.7-liter Chevrolet LS3 engine?' in their search engine. In looking at the results, there are exhaust headers: long tube, shorty and more; 5.7 headers; 5.7 Vortec headers; and exhaust headers: tubular – full length; GM 5.7 liter, 350 CID, 8-cylinder. These are just a few from millions of results, and what this tells you is that you have a visitor who wants your knowledge (which is what you wanted when you built the website in the first place) to give them the information they're looking for. This is even more powerful when it comes to trying to sell something. Because if there's someone out there about to buy a power programmer for a new vehicle, they're going to type in something like, What's the best power programmer for a 2015 Ford? Someone answering that question, and having put a little thought into long- tail keywords, will get that traffic, and is a lot more likely to get that customer. This is why long-tail keywords can be just as important as short ones, and the quicker you are to adopt their use, the more people that will be directed to you, because they can't see it with the average shorter keywords. The bottom line? More visitors, and more opportunities to make a sale. Jason R. Sakurai is the owner of Roadhouse Marketing, an advertis- ing, marketing and public relations firm dedicated to the automotive aftermarket. 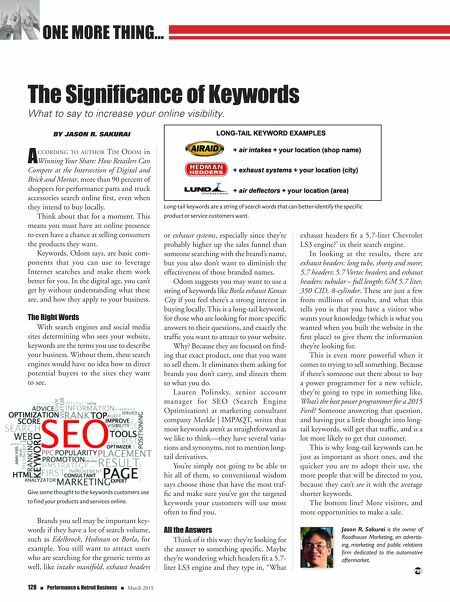 The Significance of Keywords What to say to increase your online visibility. By Jason R. sakuRai Long-tail keywords are a string of search words that can better-identify the specific product or service customers want. Give some thought to the keywords customers use to find your products and services online.